Thomas Ochs designs, constructs and repairs classical, historical, and Kasha guitars as well as electric guitars and electric bass guitars. 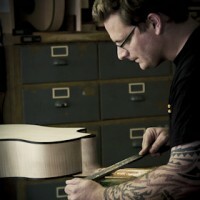 As well as building instruments, studying Guitar making History is part of Thomas Ochs daily work. He remade several historical instruments. Although he appreciates and respects the tradition of his craft, he is always looking for new ways to continuously refine the only 250 year old instrument of the guitar. Especially my classical concert guitar model, which is designed according to the theories of the physician Michael Kasha and awarded several times, is the perfect tool for virtuosos and musicians, who are looking for something special and extraordinary. Thomas Ochs received several prestigious awards for his instruments.